Native ads have better viewability and CTR. But does it improve your bottom line? Media buyers have several ad formats available in the digital advertising space including but not limited to native ads, display ads, video ads, and rich media ads. At present, they seem to flock towards the display and native ads more than other ad formats. As a publisher, which one should you go with – Native Ads Vs Display Ads? Sidenote: Of course, video ad has its own upshots, but the cost of creating a video ad is considerably higher than that of a display or native ad. Both display and native formats are implemented by publishers – big or small. While both the ad formats are effective in their own way, they are extremely different from each other in some aspects. So what exactly are they? Also, let’s find out how you can use the formats to increase your ad revenue. Let’s start from the basics. Display Ads – On certain websites, you might have seen banners of different sizes with some texts and call to actions. Well, that’s a banner ad also called as a display ad. Display ads have their own sizes and designs which can be about any service or product that they are trying to sell. It needs to be related to the website that it is being displayed on and this can be made possible because of behavioral targeting (technically, real-time bidding). Display ads have been in the online space for almost twenty years now. The first display ad was run by AT&T in the year 1994 and the rest, as they say, is history. 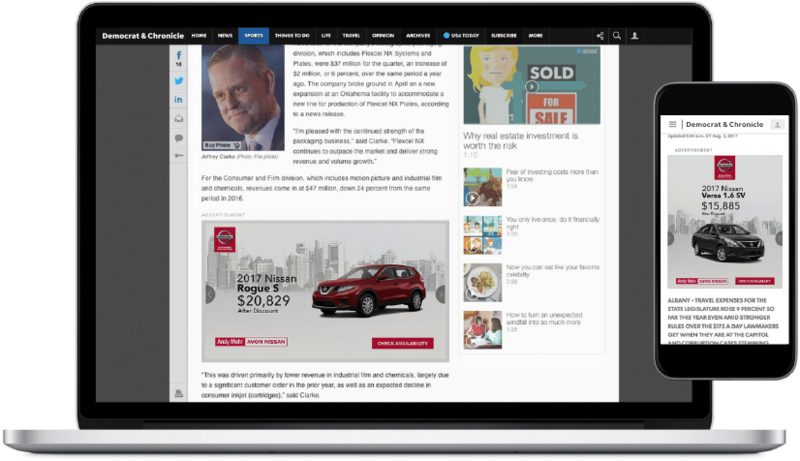 Native Ads – Ever came across that ‘sponsored’ content in the middle of your feed? That’s an excellent example of a native ad. 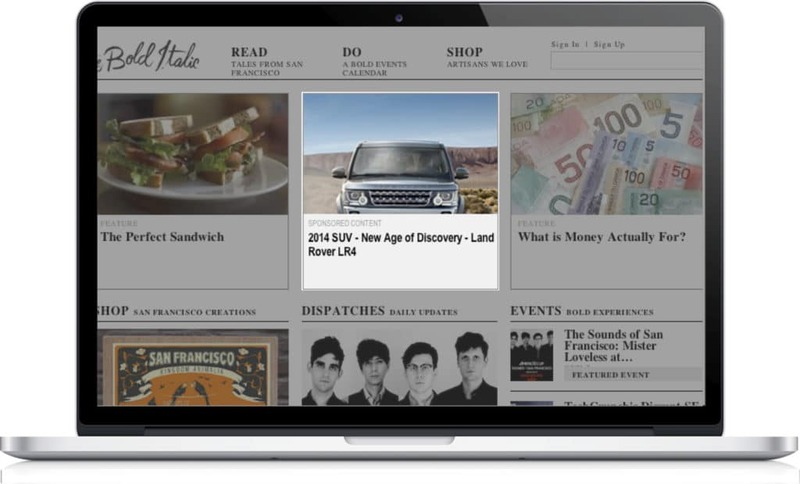 Native ads appeal to the look and feel of the website platform that they are being run on. The ads stay subtle and adapt to the environment, ensuring a better user experience. Native ads have come into the picture rather recently in the year 2011 (the beginning of social networks – largest native ad inventory) and they are getting accepted by the industry widely. Facebook audience network research predicts that around 63% of mobile ads will be native by 2020. Native Ads Vs Display Ads: How do they stand-out from each other? In the ever-growing marketing world, ads are irreplaceable. Online ads have faced heavy criticism from the audience from time to time because of their obstructive nature. However, they are still one of the most popular media of marketing out there. The attention span of readers is decreasing and therefore, it becomes increasingly important for you as a publisher to create and implement an effective ad strategy to increase your viewability and CTR. While display ads have been around for much longer, native ads are being utilized by some of the most renowned platforms such as Instagram, Facebook, and Google. Choosing between both the options can create a lot of confusion for publishers as they have their own unique advantages. Nevertheless, comparing and understanding both of these can help you figure out what works best for you. 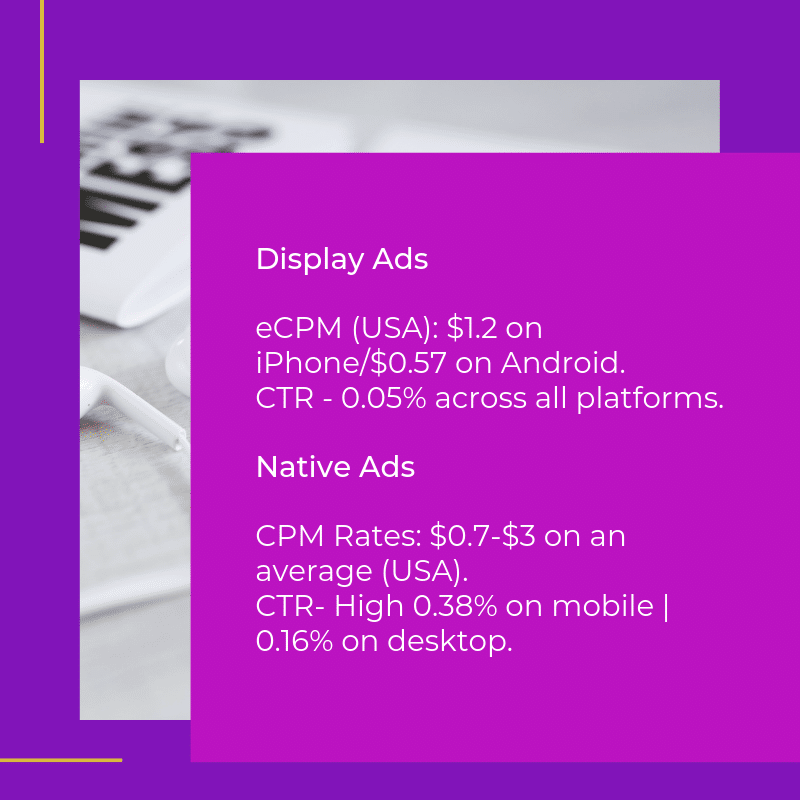 As we’ve already covered what native and display ads are, let’s dive a little deeper to understand the differences between them for better clarity. Appearance Will stand out from the website content and can be intrusive (if not properly placed). Will fit right into the website design and native ads are less intrusive. Placement Usually on the top or side of the page, aside from content copy. Within/In-between the content copy. CTR Low as display ads are often ignored. High as users tend to click the native ads. Target purpose The ideal choice for remarketing campaigns Ideal for driving the audience to the brand or product landing pages. For every business out there, the final result that matters the most is sales/customer acquisition. Be it ad campaigns or any other form of marketing, buyers tend to optimize their spend based on the ROI. As the users view the native ads more frequently than the display ads, the likelihood of users clicking on the ad increases considerably. So, more clicks mean better revenue for you? Surprisingly, no. The advertiser can, indeed, get an increased number of visits and with the right landing page and value prop, can convert them into customers. On the other hand, publishers focus on the ad revenue generated per user session. If users are leaving the site, your page views, time spent on the page, and session duration will decrease. That means you’ll deliver lesser ad impressions and your bottom line would be affected. There are some native ad networks which offer you CPC (Cost per click) rev-model, wherein you earn better with increased clicks, not the impressions. But most probably, you won’t be running CPC ads alone on your website. Besides, the majority of the top-tier ad networks and exchanges sell impressions based on CPM. So, what would you do then? 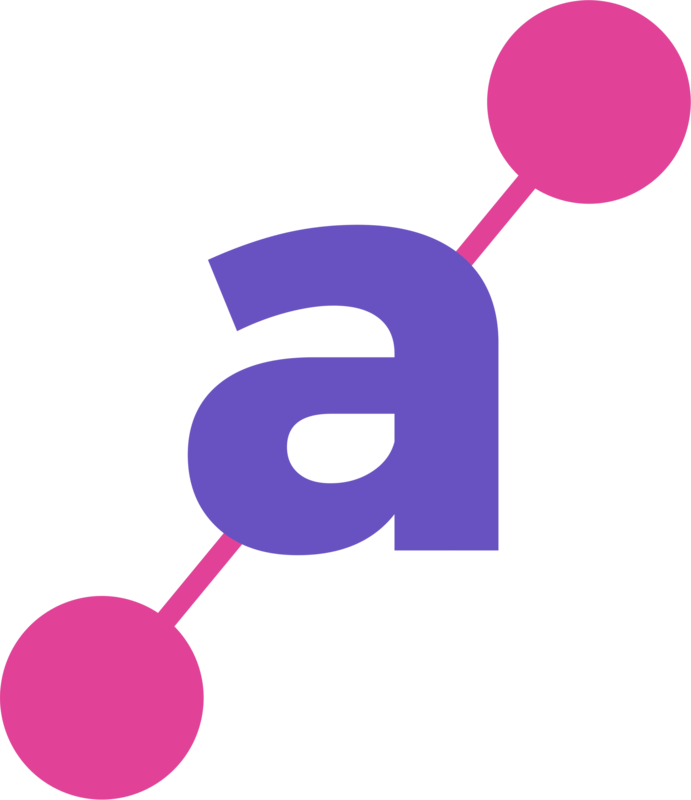 – You can find the pages with high bounce rates and place native ads on those pages. – You can pick the pages with the lowest RPM and place both display ad and native ad strategically to increase the RPM of those pages. For instance, for most pages, RPM would cap at some value and if those pages aren’t driving the users to other pages (have higher bounce rates), you can experiment with native ads. Final Call: What’s good for Publishers – Native or Banner? As a publisher, your goal is to monetize your content by displaying ads. Choosing a certain type of ad isn’t the right solution instead, you need to strike the right balance between the type of ads you choose to display. According to a report by Sharethrough, the visibility of native ads is 53% more than that of display ads. Both display and native ads can turn out to be excellent for your business if you learn to use them right. If you’re selling your impressions on programmatic ad exchanges, you should go with display ads. As native ads aren’t that competitive, CPMs may not be better. In addition, if you’re partnering with a buyer for a direct programmatic deal and the buyer pays you based on impressions, not clicks, you should run display ads. If the buyer decided to pay you based on vCPM (Viewable CPM), then you need to either run display or native – based on the average viewability.